My name is Amy Frackowiak and I received a kidney transplant. My story starts when I was only 15 years old. I was on a camping trip for the summer and upon arriving back home I noticed a small bite on the bottom of my foot. After a couple of days it became apparent that something was not right. Two red lines began to run up both sides of my foot and I had a temperature of 103. My mom rushed me to the hospital and that is where I remained for the next week. A few days later it was apparent that something was going on with my kidneys. The doctors explained that the kidneys may be stressed due to the infection and strong antibiotics and I should give it a few months to determine if there is truly something wrong. A few months passed and then it was time for my testing. Unfortunately, the labs were still showing that something was wrong. My nephrologist scheduled a biopsy and the results indicated I had IgA Nephropathy. The doctor explained that I may need a transplant in the future. Several years passed and my kidney disease worsened. At 25, I started peritoneal dialysis. I remained on dialysis for the next 3.5 years. On May 18, 2009 I received the call I had been waiting on for so long. The nurse from St. Luke’s told me that they had a kidney but the function was not optimal and asked if I still wanted it. I, of course, said yes because my kidneys were not working at all. Around midnight I finally went into surgery and received my new lease on a normal life. I was now able to do things without restrictions and it is because of a selfless donor and her family. My donor is Ninghe, an 18 year old foreign exchange student from China. She was an only child due to the restrictions that China has put on their people. I was able to speak to my donor’s best friend in 2011 after arriving back from the world games in Sweden. In 2012, I was able to meet her at a donor ceremony in Denver, Colorado. When arriving in Colorado Vickie, Ninghe’s friend, was able to pass along my donor families email address. When I arrived back in Texas I emailed my donor family. It wasn’t long before I received a response in Chinese. My donor family did not speak English so I had to use Google translate to decipher their message. Their message to me was heart breaking but really sweet. They told me about their daughter and her giving spirit and wanted me to be involved in their lives. They even invited me to their home to visit. I have not visited yet but I plan to meet the family who made the decision to give me life. In 2010, I was able to attend my first transplant games in Madison, WI. There are no words to explain this incredible event. This event gives donor families and living donors the opportunity to see how their decision to give life made a difference. At the same time it gives recipients an opportunity to honor their donor and show the public how organ donation can provide a healthy and active lifestyle. This event makes such an impact on the transplant community I decided to make it a regular event. I went on to compete in Sweden in 2011, Grand Rapids, MI in 2012 and Houston in 2014. I enjoyed the games so much that I decided to accept the role of team manager for the 2016 Transplant Games in Cleveland, Ohio. 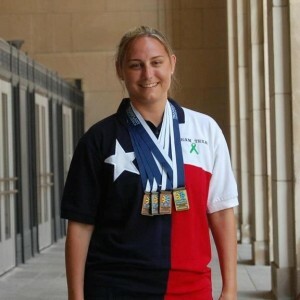 I have won many medals in the process but my main purpose is to raise awareness for organ donation and show the public the success of organ transplantation. I now work at St. Luke’s as a communication representative in transplant. I want to inspire them and provide them with hope that there is life after transplant. This job also gives me the opportunity to encourage others to donate their organs to provide life after they are gone. I can’t imagine another way to dedicate my time. Raising awareness about organ donation is my mission in life. 19 de April de 2016 a las 09:59 09Tue, 19 Apr 2016 09:59:37 +000037.